If you're sitting in a motorhome on the Col du Lauteret around 5pm on a chilly Friday evening wondering what to do, why not cycle up the nearby Col du Galibier? At least that was what we thought. After returning from our lovely hike that morning and enjoying a tasty meal we had put our feet up for a while but now felt a little restless. So, given the time of day we quickly pulled on our lycra, took our bikes off the back of the van and set off upwards. Thanks to the Tour de France the Col du Galibier is one of cycling's most famous mountain passes, where the legends of cycling have often raced each other over the 2642m high point in the bright sunshine of July on their superlight bikes. However, this Friday evening in August it got Esther and I riding our Halfords hybrid bikes in weather I would kindly describe as horribly cold. Also, we had started out at 2000m already, so 'only' had the final 600m or so to ride which was a lot less than some of our rides the previous week. However, this was the Galibier, where fans camp for a week to see their favourites ride past and paint their names on the road to spur them on. It was all pretty inspiring to us and with just 9km of riding between us and the top we went hard. It was just like the Tour de France (in my head at least) except the one nagging detail, it was just so cold. The views were the same as on the TV and we did pass all of the famous names painted on the tarmac, but you can't see the temperature on the telly. As we rode around the switchbacks and bends looking out over the surrounding peaks we pushed hard on the pedals to keep warm if nothing else and so arrived at the summit in a little over 45 minutes, which was pretty quick going on those bikes (none of the road cyclists passed us this evening). Pausing at the summit for photos and to put on our windproofs, as the sun left the mountainside completely in shadow we began our descent. Freezing would be an understatement for the descent. At one point we had to stop as we couldn't bear the icy wind any more and Esther could no longer pull on her brakes at all. Having let her warm her ice cube fingers in my previously warmish armpits (my new definition of true love) we managed to complete the ride by gritting out teeth and tensing our muscles against the chill. 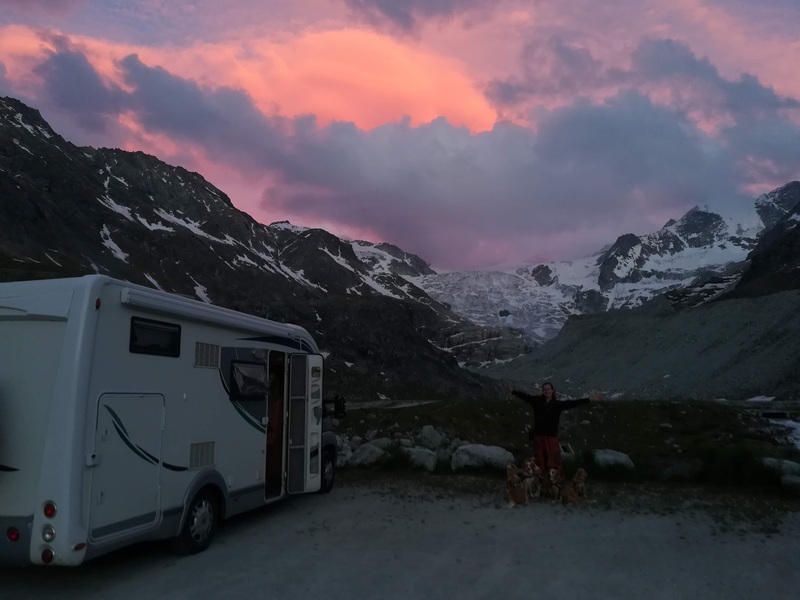 And so it was with a mix of both exhilaration and relief that we arrived back at our motorhome to pick up our relaxing evening where we had left off just a couple of hours before. Except that now we could say we'd cycled up the Col du Galibier.